You can view local history, collections and exhibitions at the Dryden & District Museum. In 1893, the Minister of Agriculture, Honourable John Dryden, was on a passenger train that stopped at Barclay Tank for water. While waiting, he noticed clover growing along the railway tracks. The clover grew from seeds left behind by settlers travelling west, clearing their railcars when they stopped in the same spot for water. Dryden thought that land which grew and spread clover in such large amounts would be good for farming and he decided to build an experimental farm. In January of 1895, Dryden announced that the Province would establish a Pioneer Farm in Wabigoon Country. This was also a way to draw settlers to Northwestern Ontario. Surveyors laid out the Township of Van Horne, near the Wabigoon Bridge over the Wabigoon Rapids, and the Township of Wainwright, north of Van Horne. A small town-site was laid out on the south side of the tracks and the Pioneer Farm on the north side of the tracks. A contractor built a log house and a frame barn, cleared brush and planted crops. The farm was 320 acres. Early in 1896, a government brochure promoted Wabigoon Country and the two townships for settlement. Many settlers left Southern Ontario to move to Dryden based on the description of the area. Mr. Andrew Ellsworth Annis, Dryden's first pioneer, was named Superintendent of the Farm and the Crown Lands Agent. Those interested in building a homestead had to contact him. He sold the first lots in the village on the south side of the tracks. In 1897, the village was officially named Dryden after Honourable John Dryden. By then, the village had grown to about 24 homes and stores, a working sawmill, more than a dozen families settled with homesteads, and more were on their way. In the late 1800s, people from far away came to the area in search of fortune in mining and agriculture. Gold Rock, one of the first mining towns in the area, was home to 200 miners and their families. People deserted Gold Rock around 1910 when gold production stopped. Forest growth now hides most of the abandoned community. It was originally located approximately 30 miles down Hwy 502. The area's original inhabitants, the Ojibway First Nation people, covered a large territory from Lake Huron in the east to Lake of the Woods in the west and beyond. Before the settlement of Dryden, the original inhabitants of the area, the Anishinaabe, used the shores by the rapids of Wabigoon River as a camping and meeting place. The Anishinaabe would come from their winter villages and trapping areas to visit each other during spring. They also used this area seasonally as a central camping site for when they would hunt, fish and harvest wild rice and blueberries. After settlement, the Anishinaabe continued to use this camp site to trade with the newcomers. When settlers built the dam in 1910, the Anishinaabe moved their camp further inland. It was close to where Dryden High School is today. They continued to meet, hold activities and to trade with the townspeople. This historical activity in our local history kept on until the early 1950s. The Anishinaabe called this special area Paawidigong, which means "the place of rapids" in Ojibway. Today, Dryden is home to pictographs, artifacts and the sacred places of the Ojibway. It is located within the Treaty Three Territory. 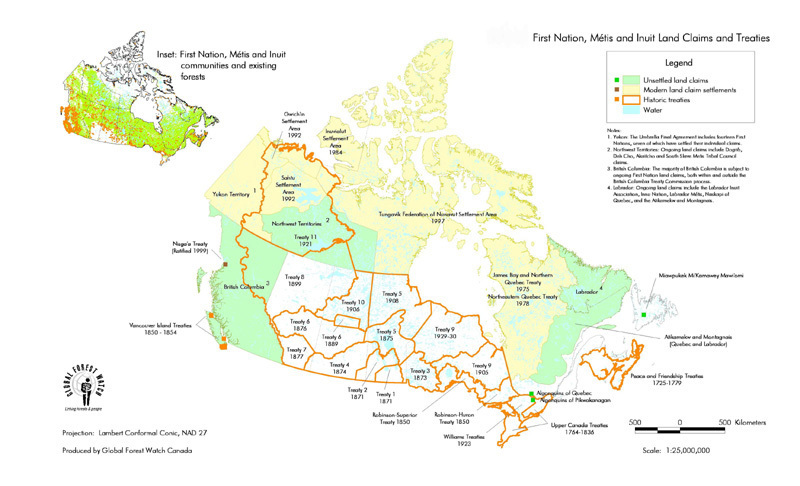 View a map of treaty locations in Canada.